Awards, Honors and Shoutouts to COIPP and its members. Nicholas Cericola Memorial Award presented to COIPP at the Family Involvement Conference on October 14, 2018. 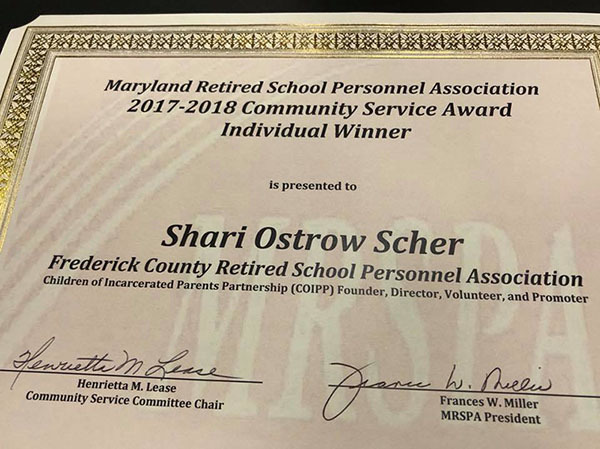 In May 2018, COIPP president Shari Scher was named the Maryland Retired School Personnel 2017-2018 Community Service Award Winner. In May, 2018, the women of the Frederick Women's Civic Club gave us a beautiful white rose and this grand, framed certificate. They do so much to serve the community- and they are thanking us! What a group! In October 2017, COIPP president Shari Scher was recognized for her work by the Women’s Democratic League of Frederick County.